Two important referenda took place in the world during the month of March 2016. There were other referenda held in some parts of the globe, but two of these are of interest to this article. One of these two referenda took place in Senegal. In that referendum one important issue for the public to determine was the proposal put forward by the incumbent president in which he proposed that the presidential term in office be reduced as the current term was too long. It is recalled that the ruling Party was not in favour of the proposal. As a result, the President opted to take his proposal to the people for their decision in a referendum. The public voted in favour of reducing the presidential term, and the Constitution will accordingly be amended to reflect the wishes of the people. It is unusual that a sitting President would opt to reduce his or her term in office. The President of Senegal has reasons for proposing the cutting down of the presidential term of office. The other referendum occurred in New Zealand. There some groups of citizens proposed that the current flag of New Zealand be changed. The change targeted the British flag which is superimposed at the top left corner of the New Zealand National Flag. That is the British Union Flag should be ditched and a new flag be adopted for New Zealand. The proposal came from a group of people who wanted to have a break with the past, to forget about their colonial history, and set new ideals for New Zealand. Two types of the new flag were also proposed: one blue with stars, and the other blue without stars. The people of New Zealand rejected the proposal to change the flag. It means that the current flag with the British Union flag will continue to be flown high in the skies of New Zealand and other of its jurisdictions. This article will not consider the reasons advanced by the President of Senegal for reducing the term of the president in office. Instead, it will attempt to examine in outline the importance of flag to a nation – state or other entities, such as, organisations, or groups fighting a sovereign state. The word flag may be used as a verb or a noun. Its simplest dictionary meaning is a banner, an ensign, a gonfalon, or a jack. All sovereign Nation – states have flags. International organisations, e.g., the UN, the International Criminal court (ICC), NATO have flags. The different UN agencies, e.g., WHO, FAO, WTO, etc, have their own flags. Even domestic civic societies, non–governmental organisations, companies, clubs, etc have flags. Groups fighting a government also have flags. Flags have been in existence for many years. Flags were used and still are used as symbols. They are employed as methods of communication at peace time or at time of war. In most cases a flag is used as a form of identification. This is the most important aspect of a flag. One may say that it is this aspect of identification that has made the southern states of the USA to continue to fly the Confederal Flag on state’s buildings alongside the flag of the USA. There are two basic parts of a flag: the Pole and the Fabric. The pole holds the fabric high. The pole and fabric are always kept in perfect condition. The fabric may consist of one colour, e.g., the all green flag of Libya during the time of Gaddafi. A flag also may consist of multiple colours, e.g., the flag of South Africa, Uganda, Kenya, Germany, etc. A flag may have a symbol superimposed at a specific spot on the flag, such as, a cross, e.g., the flag of England, Finland; a crescent and a star, e.g., the flag of Algeria, Pakistan, Tunisia, Turkey, etc. ; one or more stars, e.g., the flag of Ghana, South Sudan, China, Australia, New Zealand, USA; certain implements, e.g., the flag of Angola, Mozambique; an image of Eagle to depict sovereignty and freedom, e.g., the flag of Zambia, Zimbabwe; and so on. Some flags are easy for citizens to remember and make on their own initiative. Other nation – states have very complicated flags which require special design, or to be designed by the concerned nation – state. An example of a flag that can be made by an ordinary citizen is the flag of Nigeria: two colours green and white arranged vertically in equal width: green, white and green. Any Nigerian can make it and have it flown on their respective buildings. An example of complex flags can be shown by the flags of the USA, South Africa, Kenya, Uganda, Zambia and many other countries. The American flag has fifty stars and 13 red and white stripes. No any ordinary citizen can make the American flag without incurring huge cost. The flag of South Africa is also difficult to make privately. It incorporates at the least six colours arranged horizontally with a number of triangles, creating a kind of fantastic rain bows symbolising the new coalition and co – existence of the people of South Africa where Black and White people have equal opportunity to excel. 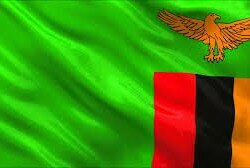 The complexity of the Zambian flag is due to three colours: red, black and copper (or orange) superimposed on a green background and on the top of these three colours is superimposed a flying Eagle which is a symbol of sovereignty and freedom. Any ordinary Zambian is supposed to know what the three colours stand for in addition to the major colour the green one. The Zambian flag can perfectly be made by a designer only. The colours of the Fabric and the various symbols added to the fabric convey the ideas, beliefs, values, and aspirations of the nation – state, an organisation or a group. These entities interpret the colours of the Fabric in different ways to fit with its own ambitions and history. For example, the French flag has three colours: blue, white and red arranged vertically and in equal width. The Netherlands flag has three colours: red, white and blue arranged horizontally. The Russian flag has also three colours: white, blue and red. Each of the three countries gives different meaning to the tricolours of its flag. There are more than 20 countries which have these three colours in their respective flags, no agreement on the specific interpretation of the colours. The French flag is rooted in the history of France. The tricolours were adopted in 1794. The colours symbolised the values of the French Revolution: Liberte, Egalite, Fraternite (Liberty, Equality, Brotherhood). The colours have not been given official explanation. One explanation is that the white represents the King (the House of Bourbon). Red and blue represent the city of Paris. At the time the Revolutionaries in Paris flew red and blue. But there is popular interpretation of the colours: Blue stands for nobility; white for the clergy; and the red for the bourgeois. The Russian flag has three colours: white, blue and red. These are arranged in three equal horizontal fields: white on the top, blue in the middle and red at the bottom. There is no explanation for the colours. But a number of Russian citizens believe that white means generosity, blue stands for loyalty and red for courage. The Netherlands flag has three colours arranged horizontally: red on the top, white in the middle and blue on the bottom. The explanation given is that the red represents bravery, strength, valour, etc. That the white stripe stands for honesty and peace. The blue band on the bottom is said to represent loyalty, justice and vigilance. These differences in explaining the colours of a country’s flag lie in the history of each country. The most important thing is that a country should give meaning to the colours of its flag so that the people know the ideals and values on which their country stands for. Pupils in schools, students in colleges and diplomats in their foreign missions must know and be able to articulate the meaning of the colours of their country’s flag. It is not an insult to claim that the majority of the people of a particular country do not know what their flag stands for let alone the colours of the flag. This can be said of some politicians, diplomats and students in colleges. There is need to include flag and its meaning in the civic curriculum of schools. All Nation – states, organisations and special groups give special status to flag. Citizens are expected to respect flags of their respective countries and to treat them as sacred. In some countries the respect of flags is inculcated in children from grade one. They are also taught to memorise the National Anthem and how to salute the flag before marching into their classes. Such practices have become rituals which every citizen must master. In most cases a flag depicts a country’s history with all its ups and downs. The German flag is such a flag: a country that has gone through difficult times since the time of Otto Von Bismarck through the two world wars and now under Chancellor Angela Merkel witnessing glorious moments of development. A flag is a national symbol and cultural identity. A national flag draped over a coffin of a deceased person represents the Nation – state’s highest respect and honour for the deceased person. A ship may fly the flag of a country of origin. But other ships may fly the flag of convenience. Such ships are flying the flags of countries that may have no ships of their own, but allow ships of other countries to be registered in their ports. In Africa an example that may be cited is Liberia. Many ships are registered in the port of Liberia and flying Liberia’s flag of convenience. A country that does not have a port because it is landlocked should acquire its own ships to transport its raw commodities and manufactured goods thereby cutting down on expenses for hiring or leasing foreign ships for the same purpose. One of the established rituals of flag is that care must be taken when raising and lowering a flag. Any of the flag’s parts should not touch the ground. If it does it is regarded as disrespect to the country.